As the BJP disowned its core election promises, many of its core supporters disowned BJP. 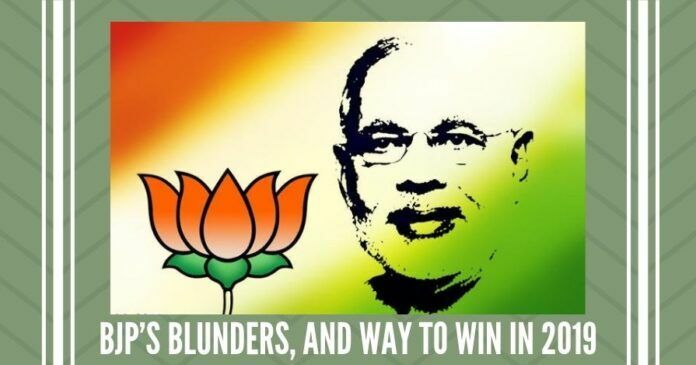 This write-up explains BJP government’s blunders/mistakes and explains what it must do in its remaining tenure to win back its alienated supporters and to have a splendid victory in 2019. It appears that BJP uses nationalism as a tool to get power. But after getting power, it forgets its core nationalist promises through which it gets power. Fed-up with Congress-led UPA government’s anti-Hindu, pseudo-secular, divisive and minority-appeasement policies from 2004 to 2014; and impressed by BJP’s nationalist agenda, countless nationalists toiled to give BJP a massive mandate of 282 seats and an absolute majority in Lok Sabha in 2014. To escape discrimination, some Hindu sects proclaim that they are not Hindu. But after getting power, BJP has forgotten its core promises for which it was known and respected. BJP has done nothing to fulfil its perpetual promises regarding “justice to all and appeasement of none”, Uniform Civil Code, abolition of Article 370, rehabilitation of Kashmiri Hindus in Kashmir, same rights and same laws for all Indian citizens irrespective of their religion etc. etc. These basic pillars gave BJP its distinct identity and enthused its supporters. After winning elections on the slogan of Congress-free India, BJP government has wasted over four years in continuing and expanding the Congress-led governments’ anti-Hindu, discriminatory, pseudo-secular and minority-appeasing laws and policies which are destroying Hindu civilization. BJP has not repealed or amended any anti-Hindu law or policy to stop blatant discrimination against Hindus and to treat Hindus at par with other communities. BJP has forgotten who had voted for it and why. Discrimination against any community can never be legitimized or justified. And this made BJP lose Assembly elections of 2018 in Hindi heartland of Chhattisgarh, Madhya Pradesh and Rajasthan. Though secularism means equality before law and non-discrimination on grounds of religion, Hindu religious and educational institutions and Hindu temples are subjected to government’s interference whereas minorities enjoy full freedom in this regard. Government’s control of Hindu temples and their estates is depriving Hindus of their right to religious freedom guaranteed under Articles 25 and 26 of Indian Constitution and is also depriving Hindus of a self-supporting infrastructure of their places of worship. To escape discrimination, some Hindu sects proclaim that they are not Hindu. While earlier, Ramakrishna Mission had claimed itself to be a non-Hindu minority, now some Lingayats in Karnataka want non-Hindu status. Dr Satya Pal Singh, a BJP member of Lok Sabha, introduced Bill Number 226 in 2016 seeking amendment of Articles 15, and Articles 25 to 30 (of Indian Constitution) to extend the religious, educational and cultural rights stipulated therein to every community, whether majority or minority. This Bill was meant to treat Hindus at par with other communities without depriving minorities of their rights. BJP’s inaction to get this Bill passed is bewildering. This Bill would lapse if it is not passed in the present Lok Sabha. While in opposition, BJP had condemned the Congress-led government’s action in constituting the Sachar Committee and Minority Affairs Ministry in 2006 as communal, divisive and “appeasement” of minorities. But after getting power in 2014, instead of discontinuing the Ministry of Minority Affairs and its divisive policies, BJP government has continued the Minority Affairs Ministry and minority-appeasement policies as ‘minority empowerment’ policies; and has also launched many new schemes for minorities. Instead of helping all Indian citizens irrespective of their religion, the government is providing various scholarships, free-ships, special schemes, financial and educational incentives to minorities. And Hindus are deprived of these benefits only because of their religion. At present BJP government is implementing many special schemes for minorities including those named as “Nai Manzil”, “Nai Udaan”, “Naya Savera”, “Nai Roshni”, “Shaadi Shagun”, “Padho Pardesh” etc. etc. Besides, renaming it as Pradhan Mantri Jan Vikas Karyakram, BJP Government has expanded Multi-sectoral Development Plan for Minorities to 308 districts. BJP government is allocating thousands of crores of rupees for these schemes for minorities every year. Amendment of Atrocities Act will perpetuate caste divisions by pitting different sections of society against each other. The Congress-led government had passed the “Right of Children to Free and Compulsory Education Act, 2009” which is applicable only to Hindu-run schools (and minority-run schools are exempt from it). This Act has made the cost of Hindu-run schools prohibitive resulting in closure of thousands of Hindu-run schools all over the country. However, the BJP government has done nothing to ensure that all schools, whether run by a majority or by minority community, are either covered by this Act or are free from this Act. Implementation of Uniform Civil Code has been BJP’s perpetual election promise. Besides, even Supreme Court has suggested its enactment in a number of its judgements. And Article 44 of Indian Constitution stipulates that “The State shall endeavour to secure for the citizens a uniform civil code throughout the territory of India”. Still, BJP government has done nothing in this regard. BJP’s Election Manifesto had promised abrogation of Article 370 and return of Kashmiri Hindus “to the land of their ancestors with full dignity”. However, the BJP government has taken no action in this regard. And by compromising its stand on Article 370 for which Dr Shyama Prasad Mukherji sacrificed his life, BJP formed a coalition government with the People’s Democratic Party in Jammu and Kashmir in March 2015. This coalition continued till June 2018. Surprisingly, BJP government has been seeking an adjournment of hearing for filing its reply on petitions for repeal of Article 35A (an off-shoot of Article 370) filed in 2014 by “We the Citizens”, and by others before the Supreme Court. Congress government had enacted the “Scheduled Castes and the Scheduled Tribes (Prevention of Atrocities) Act, 1989,” commonly known as ‘Atrocities Act’. Supreme Court’s judgement dated March 20, 2018, passed in the case of Dr Subhash Kashinath Mahajan versus The State of Maharashtra provided for a preliminary enquiry, anticipatory bail and prior approval of appropriate authority before arresting an accused under the ‘Atrocities Act’. Due to protests from some sections against this judgement, government amended the Atrocities Act to remove the provisions of a preliminary enquiry, anticipatory bail and prior approval before arresting an accused. Amendment of Atrocities Act will perpetuate caste divisions by pitting different sections of society against each other. Moreover, it will encourage caste-based politics in the country. Since the Supreme Court’s judgement duly safeguarded the basic purpose of protecting vulnerable sections of society, many of BJP’s supporters are unhappy with amendment of the Atrocities Act. To assuage aggrieved sections, BJP government has given ten percent reservation in jobs and educational institutions to the economically backward section in ‘General’ category. But instead of having a holistic appraisal of the system of reservation, this expansion of reservation would open the floodgates of further problems in reservation politics in future. Moreover, one must remember the crushing defeat of Rajiv-Gandhi-led Congress Party in 1989 after his Government passed the Muslim Women (Protection of Rights on Divorce) Act, 1986 to overturn the Supreme Court’s judgement in Shah Bano’s case following Muslims’ protests. Actions speak louder than the words. And empty slogans and rhetoric mean nothing. BJP must ensure that Dr Satya Pal Singh’s above-mentioned Bill Number 226 of 2016 is passed by the present Lok Sabha at the earliest and that it does not lapse. No one can object to this Bill since it does not take away any right from minorities. This Bill only ensures that all communities, whether majority or minority, are treated equally before the law and enjoy the same religious, educational and cultural rights. As an opposition party, BJP had criticized the Congress government’s action in constituting the Sachar Committee and Ministry of Minority Affairs in 2006 as communal, divisive and “appeasement” of minorities. It requires just a Cabinet decision (and it does not require any legislation) to abolish the Ministry of Minority Affairs and its divisive policies. Accordingly, the BJP government must discontinue the Minority Affairs Ministry; and start helping all Indian citizens irrespective of their religion. It is in the national interest, and also in its own interest for BJP to take immediate action in the above-mentioned two areas. This action would greatly motivate and enthuse its countless supporters to give BJP a magnificent victory in Parliamentary elections of 2019 as they had given in 2014. And considering the short time at its disposal, BJP must do the needful at the earliest. And become the instrument of redemption for the nation. Even though I agree with the sentiments of author, I disagree that Modi-BJP is going to loose election in 2019. First of all, the opposition is “well known corrupt & ruthless to same Hindus defined above”. Secondly, Modi has delivered his voters as well as his non-voters which they do remember everyday before going to bed. If not every moment, several times a day, the common man & woman do refresh their memory about the “real progress” in the country. Please do not disregard the power of service that make it impact on the minds of those who were and are really struggling. Modi assurance has not only been in words but in form of deeds. Modi is a master politician, he can counter unlimited money of corrupt opposition by his committed words in coming election of 2019 and he is going to win big, no doubt in my mind. What is the USE in publishing BOOKS on “NDTV-Guilt of Illegal Money Laundering”, “Unending Saga of NDTV Frauds”, “Chidambara Rahasya” – “21 Secret Foreign Bank Accounts of Karti Chid..”, “Italian Court Judgment exposing Agustawestland deal in India”, “Vijay Mallya leaves India with 6 baggages out of Delhi in broad daylight” etc. etc. Modi was too busy flying to secure foreign investments but failed miserably to fix the CORRUPTION matters that are Critical. Malaysia fixed their mistakes in record time but no action in India. Empty – Talk Talk that is the national character of India, be it Congress or BJP. Modi gave too much power and/or relied too much on his Delhi King Maker, Mr. AJ who has a different agenda that will hurt BJP/RSS core long term dreams and plans. Modi has failed to seize the great opportunity. Yes, Modi was indeed truly effective, vibrant and brought great results for India in matters pertaining to diplomacy, international affairs but was weak in the regulation of matters pertaining to domestic management of FINANCE Department [BUNGLING in the implementation of Demonetization, GST, Failing to win the confidence of Farmers and Rural India, not booking/Jailing the Top Corrupt Netas and Bureaucrats, high level of Confusion/commotions at the Core Finance sectors such as Banks, CBI, ED, RBI so the Corrupts could go Scot Free roaming freely to mock, maim, taunt and seize power back from the BJP]. From a position of strength, BJP has lost its hold to gain the confidence of the common man. Is there time for course correction? This article presents an aunthentic assessment of BJP mistakes, and identifying the most urgent policy measures that need to be taken by the government for returning to power in 2019. “Satyamevajayate” principle of Indian polity need to be reestablished.Shri Arora ji has shown a great courage and commitment to these important issues trough this article. Thanks a lot. There is still enough time for course correction & ensure BJP win in 2019. To tackle the unrelenting Missionary ,Islamist & Marxist onslaught,Hindus need to wake up now. There is an urgent need to pass Dr Satya Pal’s commendable bill in the coming session of parliament to website BJP win in 2019. Gives a road map to Nationalistic forces to win back supporters and ensure a splendid BJP victory in 2019 elections. Sh J G Arora has given a good assessment of NDA Government and advice. However, I am of opinion that some policies are worthwhile especially digital transaction,demonetization, Jan Dhan yogna… and tightening noose around the corrupt politicians to some extent. Extradition of Christian Michele has given some hope to people who want brokers and chain maker for corruption in defense deals. People have realized that we are lacking outright and honest officers at highest posts. I wish this Government should introduce bill of Sh Satya Pal Singh. I am sure that in future we will see many of his wishes fulfilled after 2019. I agree with Sh Vishwanath Krishnamoorthy to some extent. I hope that people now understand how the Nation being run by NDA in order to make assertive Nation and corruption free to some extent. My comments are embedded within the article in PDF at the below link. All the promise about bringing the corrupt to book has been empty talk. Nothing has come out of the enquiries set up for the investigation of all the scams, and some of the big names , even murder suspects, are still roaming free. The mystery of Jayalalitha’s death has not been solved and probably will never be. An immediate exhumation of the body and post-mortem examination would have easily cleared the mystery once and for all. Convicted criminals continue to enjoy special privileges even inside the jail, and honest officers who point this out are the ones against whom action is taken. Hawala transactions continue to flourish. Convicted murderers DEMAND to be released stating they are innocent, even after the highest court has found them guilty. The self-styled secularists get away playing caste politics and promoting further division of communities on casteist lines. Yet, if Modi is to be penalised for not curing the ills of the nation in 5 years, I am clear that the alternative does not lie in voting back to power those created them in the first place in 70 long years. He has to act now. 1. Apparently there are Trojan Horses in his inner circle. He has to get rid of them first and foremost. 2. The Make in India drive has to be transparent and should not suggest an indirect way of aiding certain chosen industrialists. Further, genuine research should be encouraged as in U.S. Unless politics is weeded out of the Research institutions and greater freedom is given to the scientists, the ‘brain drain’ will continue, and and there will be no “making” in India. 3. Govt. should make people more aware of its achievements – in promoting hygiene, cooking gas availability in rural area and among economically backward classes, digital monetary transactions, etc. India needs to promote the spirit of Nationalism while the political leaders of all parties including the BJP are busy making money for themselves by selling away India’s natural resources to the foreign traders. Unfortunately, the national entity called India is suffering while several Indians enriched themselves immensely. This kind of wealth concentration and economic inequity is not in the national interest. I have no comfort for BJP’s victory or defeat may not defend India from getting looted and plundered by foreign traders. Indians fought for their freedom to oppose this kind of economic exploitation by foreign companies and entities. BJP must implement its basic principle of “justice to all and appeasement of none”, and give justice to every community, whether majority or minority. Let there be justice for every Indian citizen irrespective of his religion or community. Dr. Satya Pal Singh’s Bill Number 226 of 2016 simply seeks amendment of Articles 15, and Articles 25 to 30 (of Indian Constitution) to extend the religious, educational and cultural rights stipulated therein to every community, whether majority or minority. This Bill just aims to treat Hindus at par with other communities without depriving minorities of their rights. It is surprising that BJP government has not given it the proper attention so far. This Bill should be passed by the current Lok Sabha, and should not be allowed to lapse. BJP’s loss in Chhattisgarh, MP, Rajasthan in recent elections results but what do they have in common? forceful enough to direct the bureaucracy under them. system can sustain the Indian Farmer. India was world guru when it had a cow-centric Agriculture. to buy new GM seeds. preferred to fight against England in the First World War. Botanical Service’ like the ICS. was the best form of sustainable agriculture for India. healthy food for the nation will come as bonus. about his ‘Green Revolution’ now. Chhattisgarh is the state in India, with highest per capita population of Cows, As per last available census figures against a population of 2.5 Crores there were 1.5 Crores cows in Chhattisgarh. Thus every farmer family is expected to be keeping cows there. Chhattisgarh offers a great opportunity to improve farmers’ income by promoting cow based organic agriculture there. Farmers’ income can be doubled only by a different approach to managing cows. What is required is a better administrative guidance to cow management. This suggested approach involves little state expenditure, no subsidies on farm inputs such as fertilizer etc. & no farmer loan waivers. Cow Dung & cow Urine are the best natural organic fertilizers at no cost for a Cow based Organic Agriculture. This will fetch the farmer more money. His seed will also be his own produced & free. The soil microorganism will remain healthy and reduce also the requirements of extensive artificial irrigation. Farmers would not feel forced to grow only ‘Cash Crops’ such as Sugarcane or Paddy, under unnatural farming conditions aided by extra irrigation & bought out chemical fertilizer inputs. And who exactly is going to bathe and feed the cows? Are you prepared to give up to your cushy 9 to 5 office job to do so? The so called villagers are not your slaves. They also want education and good well paying jobs. If minority can be trusted, they might have been glorifying the concessions, benefits, preferential favors given away at the expense of the citizens. Instead, we see only ridicule, insult, and violent street protests, etc from the supporters of the opposition party. They can never be the BJP’s Vote Bank. They can never be trusted allies as seen in the major defeats offered to BJP. This scholarly analysis based on objective take on the totally discriminatory preference to anti-Indian jihadis and hijabis proves beyond any doubt that BJP has gone on a wrong direction alienating the very BJ/BJP that got it to power. It is so absurd and counter-intuitive the citizens see BJP as self-destructive with no self-preservation skills bleeding to death with zillion self-inflicted cut- concrete and clear proof: loss in three states besides Karnataka. What is needed is equal treatment (not any special ones that are being given only to the minority that has a long history of colonial communal violence with no accountability being above the law of the land for several centuries long after 1947). This makes for political instability since aggrieved secular public is likely to rebel and revolt in mutiny. Not a pleasant prospect at all. Tantrums and blackmail is usual among the anti-BJP segments that cant be taken seriously. Farmers’ issues is serious, plus issue of public safety and nat’l security threatened by illegal migrants from Myanmar and b-desh. Scarce jobs are stolen by these migrants and minority who also steal land, women, etc. ; example- many churches in and around Sabari mandir, bolly type street romeo activities, etc. Many specific issues have been presented in this article ripe for corrective action. Urgent attention to these issues involving social justice and economic equality is needed by officials in IAS/IPS if not by the government. This article tells you what mainstream print and electronic-media do not tell you. Let everyone know the facts explained in this article. Let us know the facts and save our civilization. This is an excellent article. It gives BJP an urgent wake-up call. As mentioned in this article, it is in national interest, and also in BJP’s own interest to take immediate action in the two areas (mentioned in the article). This action would win back and motivate the nationalists who would work for BJP and give BJP a magnificent victory in Parliamentary elections of 2019 as they had given in 2014. Action suggested in this article is easily do-able. And BJP government must do it immediately. BJP has already wasted precious time. It must not waste any further time. It may not get such an opportunity again. interesting thoughts.. Yes BJp did betray the core supporters.. I would say modi betrayed much of his supporters by relying too much on the small coterie of advisors he has who have pretty much dominated his mind and taken off his own self in the scheme of things. 1. Voters voted for the party to bring Modi back. This time too it is the same reason if it happens. This idea cooking behind the scenes where some “tall and big” bjp leaders feel comfortable with a BJP at 200-220 votes so that an alliance with a different more “easy” and “share friendly ” leader is a dream. Voters see Queen bee and worker bees different and value them both for its own reasons..
2. I agree with the need to pass Dr Satya Pal Singh’s commendable bill. He has made some serious efforts. Modi can swiftly work on the Prvate member bill from Dr SP Singh and more importantly show resolute firmness and urgency to put through trial serious fraud cases and show that india does not want to delay and tolerate the crooked anymore and he hopes to have the voters to help him for such actions against a system which has gone awry.. Fear is the faster way to bring the house in order, pride must be built too and he is doing that well.. But pride alone may take a generation or two just like it took a generation or two to fully get corrupted..